From kitchen to table in 45 minutes. Dice onion and ham. 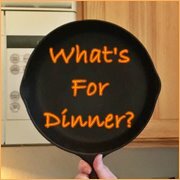 Melt butter or margarine over medium heat in a skillet and saute onion and ham until onion is tender. Spray casserole dish with non-stick cooking spray. Preheat oven to 350 degrees. Beat egg and stir in shredded cheese, crushed tortilla chips, milk and pepper. 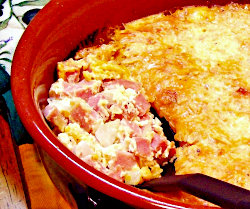 Transfer ham and onions from skillet to casserole dish. Pour egg and milk mixture over the top. Place in hot oven. Bake for 40 to 50 minutes or until a toothpick inserted into casserole comes out clean and the top is brown.